Though pictured on the back of the Star Wars 20 and 21 back cards with a Han Solo blaster, the figure was packed with a Stormtrooper Blaster. 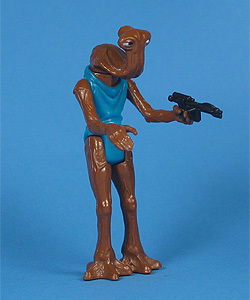 Though this figure was originally included in the Cantina Adventure Set, it made its first appearance on the Star Wars 20 back card. Comments: The name Hammerhead is tantamount to the simpler days in which the figure was produced. Back then Star Wars fans weren?t inundated with the volumes of Expanded Universe character studies that today?s collectors have to deal with. Our guy here in the blue bodysuit was just a dude hanging out with his pals in a bar --even though it was still the middle of the morning if you follow A New Hope's timeline-- and not being an undercover Rebel on a mission who just happened to have a thing for plants. Thinking about it, if he were indeed that EU guy, he would have gotten to Tatooine in a Rebel ship of some sort, and the Rebels must have known he was on the same planet as Obi-Wan and the Death Star plans... (I digress, but I think the point is made nonetheless)... If for no other reason, this guy gets props for having a cooler (and easier to pronounce) name than Momaw Nadon? Major Variations: Though all vintage figures have minor variations, the Hammerhead figure has no major variations.